CARFAX 1-Owner, GREAT MILES 17,500! Oxford White exterior and Ebony interior, EcoBoost trim. Back-Up Camera, iPod/MP3 Input, Turbo Charged, TRANSMISSION: 10-SPEED AUTOMATIC W/SE... BLACK ACCENT PACKAGE. READ MORE! 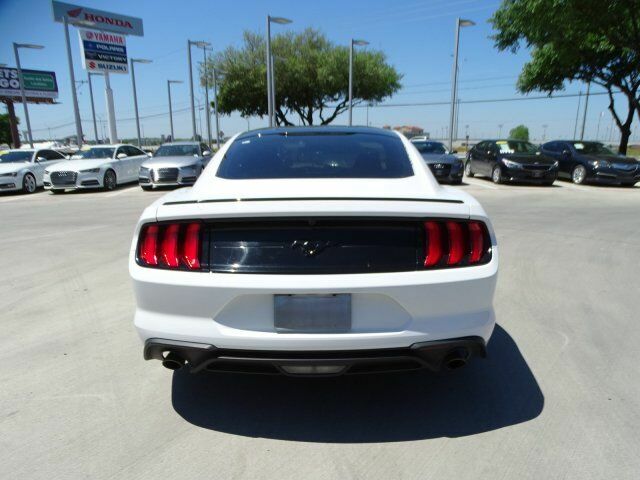 Back-Up Camera, Turbocharged, iPod/MP3 Input Ford EcoBoost with Oxford White exterior and Ebony interior features a 4 Cylinder Engine with 310 HP at 5500 RPM*. TRANSMISSION: 10-SPEED AUTOMATIC W/SELECTSHIFT steering wheel paddle shifters, Leather-Wrapped Shift Knob, 3.15 Limited Slip Rear Axle Ratio, BLACK ACCENT PACKAGE Tires: 19", Black Front & Rear Pony Badges, Wheels: 19" x 8.5" Ebony Black-Painted Aluminum, Black Blade Decklid Spoiler. MP3 Player, Onboard Communications System, Keyless Entry, Steering Wheel Controls, Electronic Stability Control, Bucket Seats, Electrochromic rearview mirror. KBB.com's review says "Now a sophisticated modern muscle car, the new Mustang delivers power, style and performance at a price almost anybody can afford. ".